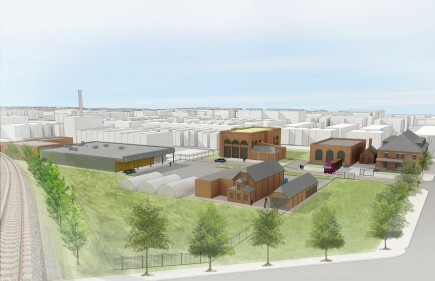 The Baltimore Food Hub at the Eastern Pumping Station has been awarded $3 million in Sustainable Communities Tax Credits, administered by the Maryland Historical Trust. The Eastern Pumping Station is comprised of two structures constructed in 1890, and a third Machinery Building which was added in 1902. Located within the South Clifton Park National Register Historic District, the Eastern Pumping Station contributes to the industrial history of East Baltimore. Ziger/Snead is partnering with American Communities Trust to rehabilitate the 3.5 acre site into a food production campus, called the Baltimore Food Hub. Plans for the campus include a commercial kitchen, a canning facility, and office and training space for food entrepreneurs and start-up businesses. The project will transform the abandoned site into a centralized hub for local and socially responsible food-related enterprises to contribute to a regional network of local and organic food production. The Baltimore Food Hub will provide employment and entrepreneurship opportunities for low-income residents and revitalize the distressed Amtrak corridor in East Baltimore as one of Baltimore’s major gateways. $10 million in state tax credits was distributed between nine historic renovation projects across Maryland. Four of the projects selected are in Baltimore City. The Sustainable Communities Tax Credit program is committed to preserving the historic buildings and structures which have shaped the identity of Maryland towns and cities, while funding sustainable growth. The Maryland Historical Trust estimates that the tax credit will create 894 jobs, and leverage around $76 million in private investment for the year 2015. From its foundation in 1996, the program has invested close to $360 million in over 3,995 residential and 616 commercial historic sites. More information can be found on the Maryland Historical Trust website, the Maryland Department of Planning website, and at www.baltimorefoodhub.com.